(CNN) - Sen. Rand Paul of Kentucky got some laughs Friday with a line inspired by the Army Sgt. Bowe Bergdahl release, but the political opposition found his remarks out of line. “Mr. President, you love to trade people. Why don’t we set up a trade. But this time, instead of five Taliban, how ‘bout five Democrats,” Paul said to cheers at the Texas GOP convention in Fort Worth. He was referring to U.S. Marine Sgt. Andrew Tahmooressi, who says he accidentally crossed the border from California more than two months ago with several guns in his car - firearms he says he legally owns, but are unlawful to bring into Mexico. Following Bergdahl's exchange, some lawmakers have renewed their calls for Tahmooressi's return. Paul's remarks come as the potential presidential candidate tries to broaden his appeal to not only a wider swath of the Republican Party, but also to some Democrats. He told a local radio station in Kentucky last month that people are looking for a candidate who carries “the best parts of what Republicans stand for and also some of the good things the Democrats stand for." "A lot of people who aren’t that partisan one way or the other say a good mix of ideas from both parties might be what we’re looking for," he continued. Michael Czin, press secretary for the Democratic National Committee, argued Paul's remarks are "completely out of line." “Comments like this are just the latest example of the GOP politicizing important national security matters to feed to their base," he said in a statement. "Try for a little more civility going forward." Earlier this week, Paul came out strongly against the Bergdahl trade, saying on Fox News he's not sure it would be a good deal, even "if we were trading for a Medal of Honor winner, much less trading for somebody who may well have been a deserter." Paul said he would only entertain the idea of a prisoner swap if there was an end to the war in Afghanistan. Asked what he would do if the released Guantanamo detainees get back on the battlefield and plot to kill Americans, Paul said, "there would be a drone with their name on it." 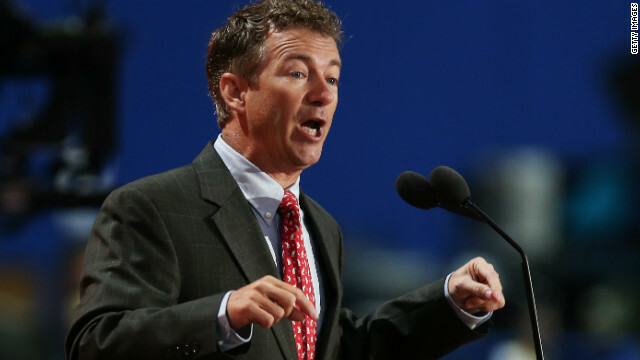 His comments Friday are the latest of seemingly stepped-up efforts to build his national security profile, an area of policy in which GOP donors have expressed skepticism about Paul, given his libertarian leanings. Let's trade Rand and four of his friends. @Marcus-To make the comparison with regards to the swiftboats to Bergdahl is complete nonsense. Kerry had fellow sailors to back him up that were there. Bergdahl has no soliders backing up his claim. Your use of the swiftboats in nothing but spin trying to cast a negative light on honorable soliders. There is much more to this story than a few soldiers getting their 15 minutes of fame on national T.V; including whatever it was that happened that last night before Berghdahl was captured. That these soldiers have willingly and with malice aforethought gone public with their beef against a fellow soldier SHOULD be questioned because they allowed themselves to get caught up in a political arena they aren't savvy enough to understand or manipulate to their benefit. They and the unit they served in have now become open to the public forum for debate. They opened that door. I hope for their sake they are able to withstand the scrutiny in the same manner they are themselves willing to scrutinize a POW. I'll end my little rant with a McCain quote: "I had learned what we all learned over there: Every man has his breaking point. I had reached mine ... " Apparently not all are afforded that luxury of hindsight and salvation in the months before an election in the year of our Lord 2014. Is this the same Rand Paul that has made his fame fortune and following ranting about the rights of Americans that join the Taliban? The people have spoken. They have no due process, or any other right. Shoot them, leave them there to die, drone them with their buds. I suggest you not try to milk anything out of this.You are as much a traitor as those you defend. Mexico? Does this ignoramus realize that Texas was part of Mexico? Why don't we send the whole freakin state minus Austin back. Either the whole state incl. Austin or nothing, remember when Gov. Perry talked about separating, and President Obama said no, maybe it would have been better. The majority of the state is already of Mexican descent. -I staunchly doubt if any of these republican thugs even qualify to be cooks in the WH, let alone presidency. .... As long as there are people like you, who every day call those who don't agree with your ideas, every ugly name you can think off, spread hate and lies, then this country will stay divided. Is this the same Rand Paul that has made his fame fortune and following ranting about the rights of Americans that join the Taliban? Why, yes, yes it is the very same Mr. Rand Paul that moaned over those killed while fighting for the other side while not getting "due process". When you want a hypocrite, I present you the GOP. It always amazes me that these "chicken hawks who want war so badly, but have no clue what it is like suddenly become experts- so easily able to judge the guilty from afar (much like playing doctor via videotape) without due process, harassing this man's family- casting guilt on them all- all while wrapped in the flag saying how much they love our troops. One of the key tenants of our philosophy of government- going all the way back to our "Founding Fathers" (whom the Right claims to revere) is that one is innocent until proven guilty. Until that process plays out, Mr. Bergdahl is simply a long missing soldier now returned. If the military later finds he was AWOL, or worse a deserter, so be it. But filling the airwaves with lies and hate so reflexively because you get to "bash Obama" again is simply sick- and really, is you stopped to think about it- not very patriotic. As far as those 5 former Afghan public officials you're wetting your pants over- they have been out of circulation for what, a decade? They are now guests of the government of Qatar more or less until the war is over. If the GOP really wanted to punish them so badly, they should have let them go to trial- but they didn't. We are a government of rules gentlemen, we do not hold people indefinitely without charges or a trial. Facts, my friends- inconvenient ones for you holding the pitchforks. He's filed a lawsuit against the US government thus protecting their rights against being droned. A United States soldier captured and held for 5 years in captivity merits nothing more than a joke from Rand Paul. People like Paul prove the GOP cares nothing for our soldiers and our Vets. The GOP- and creatures like Paul, vote to go to war- on lies, without a plan not caring what the results are; vote down expansion of the VA; jobs programs for former soldiers; food assistance for former soldiers; and now they try members of the military in their media- finding them "guilty" of being AWOL, desertion, and some have even said terrorism and treason. And, they have extended that the the soldier's family. Talk about "government run amok"! The GOP is so blinded by their hatred of a duly elected President and the federal government that this is what they stoop to. Remarkable and revolting. Mash Mouth Rand Paul had the courage to throw down the "Gauntlet"
Okay, Senator Paul. You want to play the trolling game, FINE. Instead of five Taliban or five Dems, let's send over Glenn Beck, Sarah Palin, Phil Robertson, Cliven Bundy and Scott Walker! OK, we get it. That's what is 'funny' for you. And for your supporters. Blissful ignorance of the Constitution, hollier-and-better-than-thou-attitude towards those who oppose your points of view, not taking seriously a situation that involved a human life (and the one of an American soldier at that) at stake and all that aimed at an audience who thinks knows more about the human mind than those who happens to study about it for years and years (there's no need for a cure for what is not a disease already said Freud back in the 1920's). We got it Rand, we really got it. @ Smith – the fact that YOU keep denying the existence of Anti Assad groups that are NOT jihadist speaks volumes about your knowledge of the situation in Syria. @ No, not so fast ... – Good point, but of course, as soon as anyone starts to look into these guys' files and past we will see the same support for this action from those who uses their words to condemn Bergdahl that they are showing now for the scrutiny put in Bergdahl's record, right?